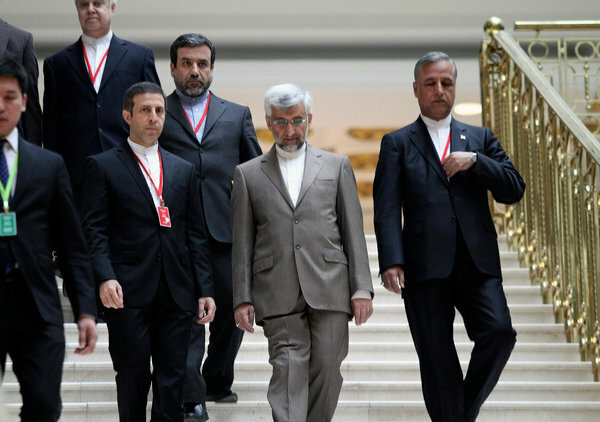 Almaty, Kazakhstan__An Iranian diplomat, in an interview with Al-Monitor, offered a cautiously positive take on the nuclear talks that got underway in Kazakhstan Tuesday, though he said Iran still considers that a new international proposal asks more of Iran than it offers. “I can’t say what will be the outcome,” the official continued. “But we think the outcome should be some technical meetings.” That would seem to correspond with what Western diplomats said Monday, that they were hoping to have a follow up meeting, or a series of follow up meetings, with the Iranians at the technical experts level, ideally beginning before Iran’s Nowruz New Year’s holiday in March. Both Iran and the P5+1 agree that a comprehensive deal “is not possible right now, so both sides are trying to solve one part of it,” the Iranian diplomat said. “Both sides agree on which part to solve right now,” as a first step, focused on Iran’s 20% enrichment activities, he said. The updated P5+1 proposal formally presented to Iran Tuesday includes some sanctions relief on the gold trade, petrochemical industry, and some small scale banking sanctions, according to a source close to the talks who received a copy of it late Monday from a permanent member of the United Nations Security Council, Al-Monitor first reported earlier Tuesday. “We have come here with a revised offer and we have come to engage with Iran in a meaningful way, our purpose being to make sure that we’ve had a good and detailed conversation, with the ambition that we see progress by the end of the meeting,” European Union foreign policy chief Catherine Ashton said ahead of the first round of talks Tuesday. The revised international offer is “balanced” and “responsive” to what the six powers heard from the Iranians in three rounds of talks last year, Michael Mann, spokesman for Ashton, told journalists at a press briefing in Almaty Tuesday. Talks got underway Tuesday at 1:30pm and broke off at about 4:30pm. Western officials later confirmed that there had been further consultations among the parties, including Iranian bilateral meetings with the Germans, British, Chinese and Russians, a diplomat said. Talks will resume for a second day Wednesday, starting with a bilateral meeting between Ashton and Jalili, followed by a plenary session at 11am. “We had a useful meeting today, discussions took place this evening, we are meeting again tomorrow,” a western official said late Tuesday. The U.S. delegation to the talks is led by Under Secretary of State for Political Affairs Wendy Sherman, and includes National Security Staff Senior Director for the Persian Gulf Puneet Talwar, State Department arms control envoy Robert Einhorn, another State Department arms control advisor Jim Timbie, Assistant Secretary of State for Public Affairs Mike Hammer, and a veteran Farsi-speaking US diplomat who specializes in Iranian affairs Alan Eyre. Iran’s delegation includes the Secretary of Supreme National Security Council Dr. Saeed Jalili, his deputy Ali Bagheri, legal/nonproliferation advisor Hamid-Reza Asgari,, the head of the Iranian foreign ministry IPIS think tank Mostafa Dolatyar, Iran deputy foreign minister Seyed Abbas Araghchi, and former Iranian ambassador to the UK Rasoul Movahedian-Atar.